I love this book series! And she looks fabulous! Great interpretation! compte tu faire les autres? wow!! you really did a great job on her! You going to do the rest of the dragonets? I do plan to drew rest of them between other work yeah! 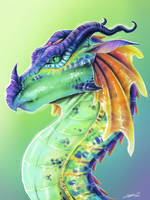 Such a pretty Wof Draggy!! !